When you land in Hawaii, you can immediately smell the sweet aroma of the islands’ many tropical flowers. It’s one of the many reasons visitors flock here. But, what if I told you the most popular flower in Hawaii right now smells like a dead body?! That’s exactly what’s happening at Foster Botanical Gardens this week, as one of the world’s smelliest flowers is in bloom. The amorphophallus titanium, also known as the Titan Arum plant, is about 5′ 9″ tall (although others have reached heights of more than ten feet)and is on display at the botanical gardens. On July 4th, “Miss Liberty” bloomed and should stay in bloom for three to five days, depending on temperature. The warmer the temperature, the faster the wilt. 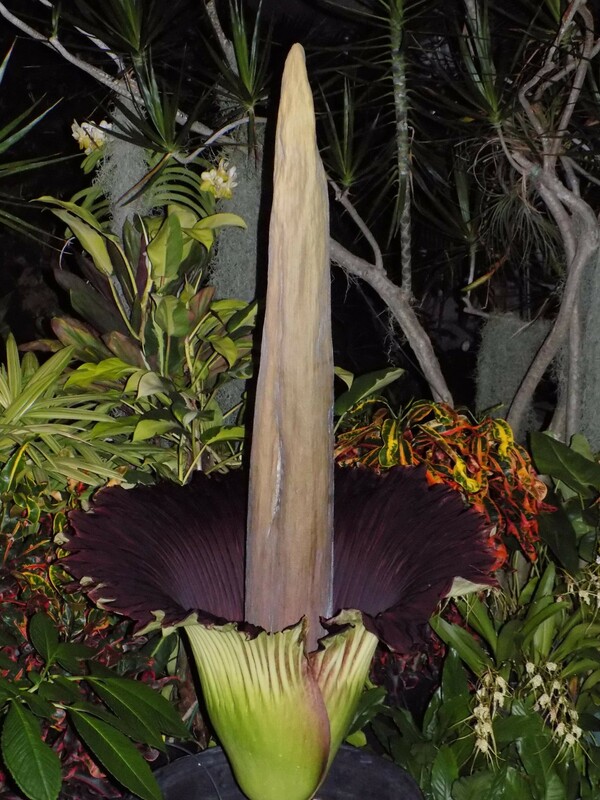 According to Foster Botanical Gardens, because of its stench when in full bloom, the plant is also called the “corpse plant” or “corpse flower.” The plant is pollinated by carrion-eating beetles and flesh flies. So, in order to attract pollinators, titan arum uses several tricks to convincingly mimic a rotting piece of meat. The corpse flower’s deep red color and texture, along with the powerful scent contribute to the illusion. Analyses of chemicals released by the spadix shows the fragrance includes dimethyl trisulfide (found in limburger cheese), trimethylamine (found in rotting fish) and isovaleric acid (found in sweaty socks). 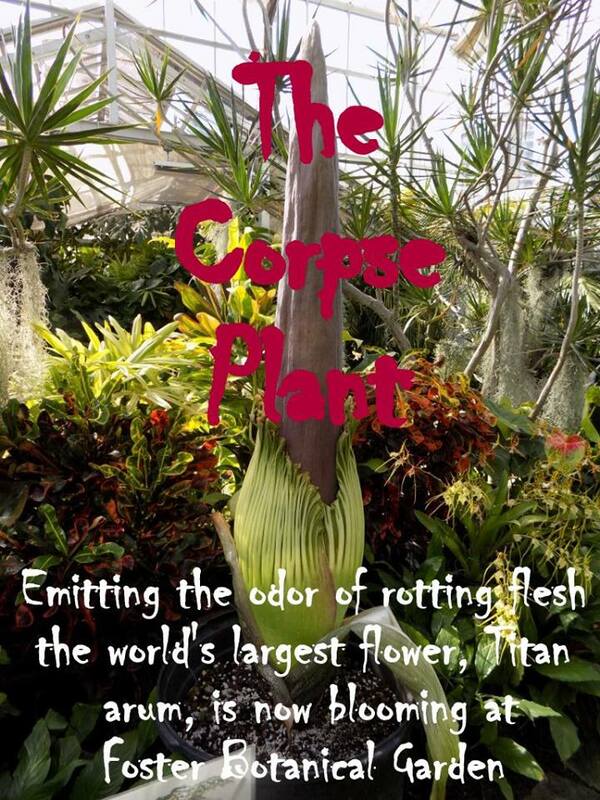 The "corpse" flower smells like rotting flesh to attract carrion beetles. This will be the first blooming of this particular titus arum plant, which has had eight years of growth from seed. After the initial blooming, there may be considerable variation in blooming frequency. Some plants may not bloom again for another seven to ten years, although others may bloom every two to three years. There have been cases of back-to-back blooms occurring within a year. It is native to Indonesia, the Philippines and other islands of the South Pacific. The bloom is actually composed of a large leaf that acts like a petal and a central stalk with many male and female flowers at its base. The largest flower in the world, also native to Sumatra, is Rafflesia arnoldii, which also deceives insects with the smell of decay. The plant consists of a fragrant spadix (spike) of small flowers, which resembles a large loaf of French bread. The spadix is wrapped by a spathe, which looks like a large petal and is green on the outside and dark burgundy red on the inside. The "corpse" flower has quite a reputation! After being pollinated, the spath on the corpse flower falls off and exposes the mature, orange-red fruits with seeds inside. The bright color probably attracts birds to eat the flesh and disperse seeds elsewhere. After several months of dormancy, the corm will send up a new leaf. If you’d like to meet the titan arum face-to-face, Foster Botanical Gardens is open from 9 a.m. to 4 p.m. seven days a week at 50 N. Vineyard Blvd.